When you need an extra energy boost in the morning, start with this hearty breakfast option that will power you through the busiest of days. Steel-cut oats are nutritional superheroes by themselves, but when infused with whole black tea leaves, they take on even greater powers. Along with ginger, cinnamon, cloves, allspice, and cardamom these ingredients come together to create the warm spiced flavor of a comforting cup of chai tea. Using the MultiPot Pressure Cooker, a gluten-free, dairy-free breakfast is ready to serve in 20 minutes. It is a dish that is as delicious as it is invigorating. Steel-cut oats are great for preparing ahead of time! After cooking, the oatmeal can be refrigerated and stored for up to 5 days or portioned into individual ramekins and frozen for 3 to 4 months. 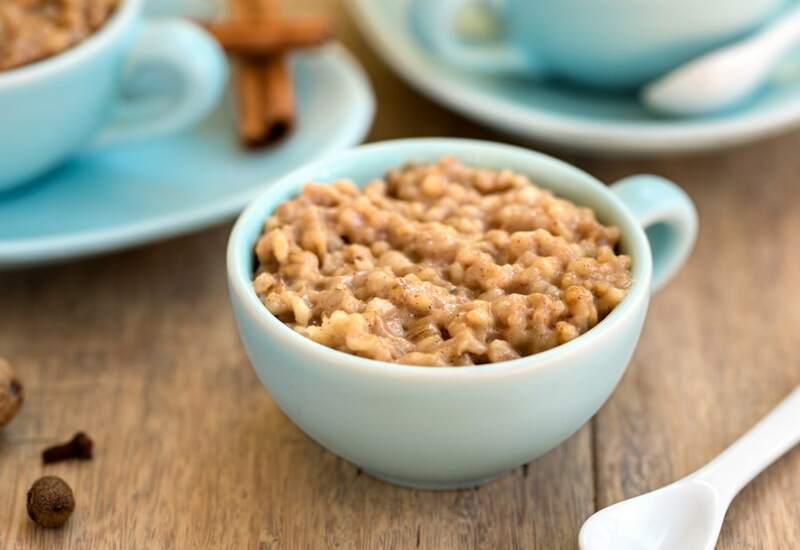 When serving the oatmeal after freezing, allow to fully thaw in the refrigerator overnight before heating in the microwave or on the stovetop. Per Serving: 382 calories; 14g fat; 50.3g carbohydrates; 15g protein; 17mg cholesterol; 371mg sodium. I usually only LIKE oatmeal made with rolled oats, so I'm always scouting for good steel-cut oats recipes. Though I love chai, I was skeptical this would work, but it really does. I put the spices in a cheesecloth package so I wouldn't be eating tea leaves. Otherwise, followed pretty closely. Made a big batch, refrigerated the extras and then turned into a bunch of oatmeal patties to pan-fry for grab-and-go treats. Really, really good way to eat this oatmeal, btw. I bought a container for steel cut oats by accident, and it sat in my pantry for awhile! When I saw this recipe, I had to try it so I could put them to use. I already loved chai flavor, and this oatmeal tastes like a piece of heaven. There's a lot of spices in this recipe but they all blend together nicely, making this a delicious, aromatic dish. Very good chai latte oatmeal! They were so easy to reheat on the stovetop the next day. I love the ginger and cardamom spices, so festive, and a great fall recipe that's not pumpkin spice. This was good. I didn't have ginger so I had to omit that. I also used vanilla flavored oat milk so I nixed the vanilla extract. I tossed a regular grocery store tea bag in there & just fished it out at the end. Yum. This is a great post work out breakfast. I changed out the maple syrup with pure agave nectar and also tossed in a scoop of protein powder.